Check our calendar for the dates of these fun events. Lights, Sirens and Santa Clause! Santa and his firefighter helpers make rounds throughout the fire district handing out candy canes and collecting food for area food banks on weekends and evenings in early-mid December. Check back for 2018 schedule and route info. 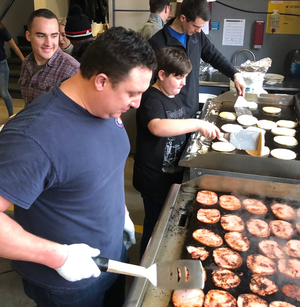 This egg-stravaganza of an event has become a community favorite hosted by the East Pierce Volunteer Firefighters' Association on the day before Easter Sunday at Station 19 in South Prairie Station. 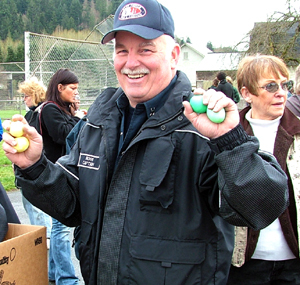 Nearly 1,500 brightly colored REAL eggs are "hidden" for children of all ages to find. The bunny himself might hop on in for a visit! 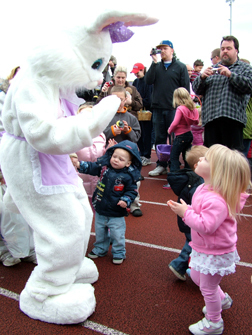 This fun-filled, bunny hoppin', candy scramblin' event is sponsored by East Pierce Professional Firefighters Local 3520 on the day before Easter Sunday from 9am-noon at Sumner High School's Sunset Stadium. Children ages 1-12 years can participate in this free event. Firefighters flippin' flapjacks and serving up holiday cheer - all for only a $5 donation per person! Funds raised help provide local less fortunate families with a brighter Christmas, and year-round emergency support. 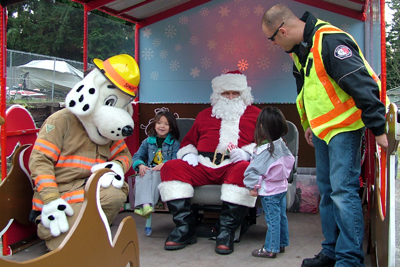 Join us the first Saturday of December from 7am-noon at Station 113 in Sumner. Look for us at these events, too!